Just how many more innocent lives must be lost under this regime? 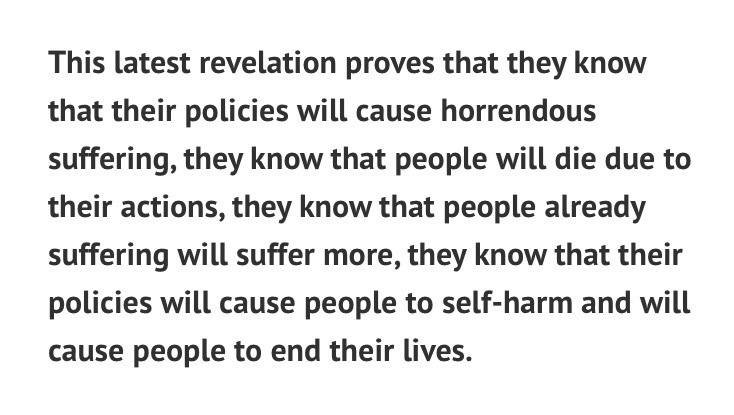 The recent revelations surrounding the supposed ‘training‘ given to DWP staff on what to do if a recipient says they’re going to self-harm or commit suicide is simply passing the blame onto people that are unprepared, untrained and unqualified. They shouldn’t be dealing with such delicate circumstances, we are talking about human life here, people that are in such horrific circumstances that need genuine and useful help and support, but are being shunned and abandoned. Please signthispetition to force parliament to assess the impact of welfare cuts and then share it far and wide, thanks! This doesn’t just highlight the inadequacies of the DWPand welfare in general but also the inadequacies and underfundedmental health services within the NHS. It reveals how little is being done in support of people with mental health difficulties and how the Conservatives aren’t taking mental health seriously.